Last time I wrote about Evernote, I got some great responses from readers and fellow entrepreneurs. It is a powerful tool! One friend of mine refers to her Evernote as her “external brain.” It’s a place where she can quickly capture any task or idea to find later. 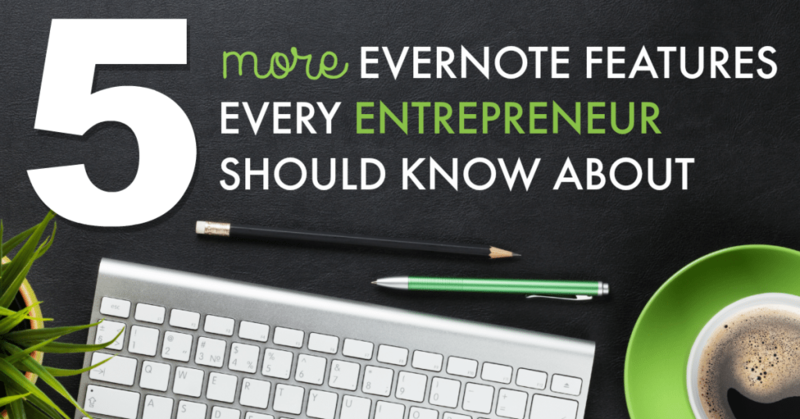 Here are a few more tricks that you might find useful as you start to leverage everything Evernote’s got to offer. 1. Create actionable “to-do” items. All you have to do to enable this feature is click the checkbox icon to insert it in a line of text in your note. 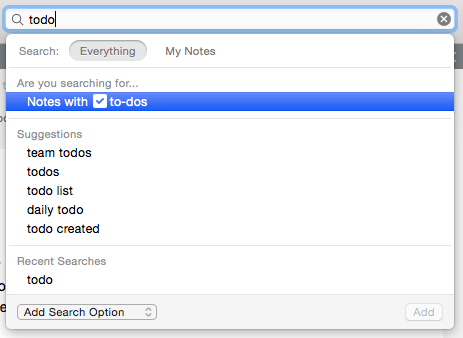 Then, you can search “todo” in your notes and you will see an option for Notes with to-do’s. Voila, you now have the option of showing only notes in which there was an action you wanted to take. 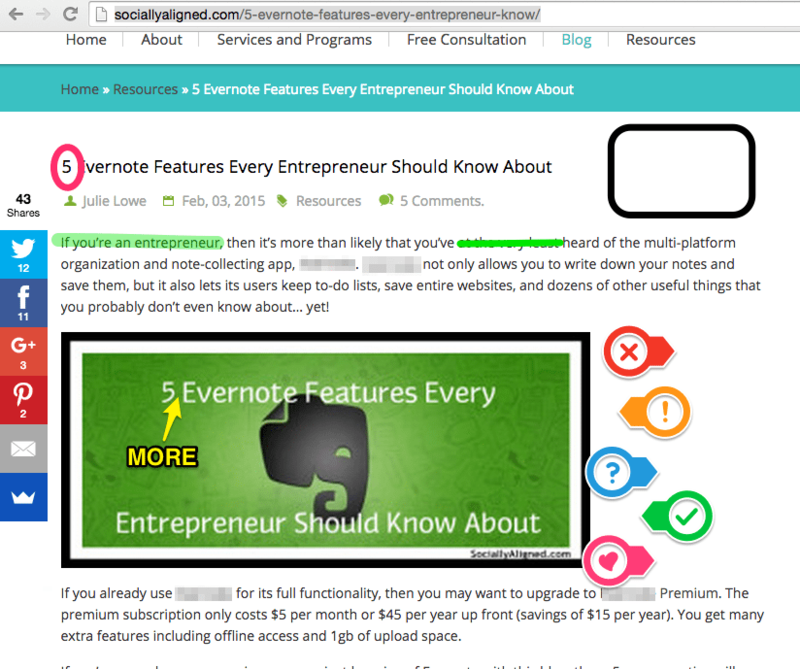 Okay, sorry if you’re a purist, but this one is not an Evernote trick exactly. Skitch is a screengrab, annotation, and drawing tool wrapped into one. When you use Skitch, you can save a screenshot and mark it up with arrows and text and drawings. There are different colors and even shapes you can use if you really crave complexity. I find that it’s helpful when I need to send a screenshot to a client and I want to blur out another client’s sensitive information. Forgive the really busy markup, but I just had to try to show you EVERYTHING. Can you spot the highlight? The line-out? The blurred words? All without ever leaving Skitch, saved automatically to my Evernote. Tags are great for linking information across multiple notebooks. Tagging notes creates a thread that can connect a note in your blog posts notebook with articles in your stash of saved articles, for example. Evernote is already mega-searchable. Tags are an added boost. Your Skitch notes can be found with… you guessed it, a Skitch tag. If you’ve ever participated in a mastermind-type group, you know that you want to soak up every word of feedback you get to digest later. Simply open a new note and press the microphone button. Now you can record everything that is shared with you about your brilliant idea, and listen back to it later on any device that’s convenient for you. Who says Evernote has to be all work and no heart? All moms know that children grow up excruciatingly quickly. You can use that same recording feature to record your kiddo saying something really cute, or singing a song. You could snap a picture and tag it with his or her name. You can either have a notebook dedicated to memories or you can use a ‘memories’ tag so that you can drill down easily to go on a little walk down memory lane. Make sure you have tissues nearby in case this causes you to get a little nostalgic and weepy.